He’s a household name among crime fiction aficionados. His books have been translated into fourteen languages and are sold in more than twenty countries in the world. His last novel, Peraiosis, has sold fourteen editions in Greece (that should be over thirty thousand copies) in a little less than a month. And yet not many people know him in the English speaking world. I believe that sooner or later that is going to change. Petros Markaris is one of those writers that somehow manage to try their hand in many different writing fields and succeed. He’s written crime novels, short stories, plays and screenplays (for Theo Angelopoulos among others), and translated the works of Goethe and Brecht from German to Greek, as well as quite a few books from and to Turkish. And he’s created a fictional hero that seems to openly express the thoughts, feelings and worries of the Greek people about what’s going on around them. Costas Haritos, a CID chief who lives in Athens with his eccentric wife and troublesome daughter, doesn’t have many things to share with his European or American counterparts. Forget the lonesome figures of the American procedurals or thrillers, leave behind the angry souls fighting crime in a system that seems to protect the perpetrators more than the victims, and do not expect to meet at his face the guzzler detective that tries to drown his sorrows in a bottle of whiskey. Haritos is something and somebody else. Not that he doesn’t drink or doesn’t like his food, not that; the difference is that he does everything in moderation. Once the readers get to know him well they’ll come to understand that he lives and breathes for his job, but that doesn’t turn him blind to the world. He may love what he does for a living, but he’s not obsessive about enforcing the law if the ends don’t justify the means. He wants to do what’s right, according to his own code of ethics, and if to accomplish that he has to turn a blind eye every now and then, well, he’ll just do that. He’s kind of a loner, truth be told, but he’s a man of the people as well. He can feel their pain and their agony, he can speak their tongue. In these turbulent times for Greece, Markaris seems to be the only writer who can really talk about what is going on in the country. 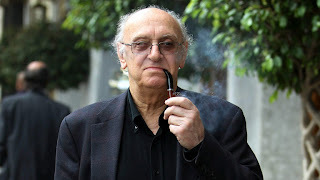 In 2010 he brought out the first book in a trilogy (The Trilogy of the Crisis) titled Overdue Loans (Lixiprothesma Daneia) about the current economic and social realities in his homeland. In that book an unlikely avenger starts killing local and foreign bankers and urges the public, through posters on the city’s walls, not to pay their debts to the banks. Haritos needs to find and arrest him before things get completely out of hand. In Peraiosis or Completion that came out a year later a man that calls himself the Tax Collector starts killing tax evaders in order to scare rich people into paying their taxes and thus filling the state coffers, and Haritos finds himself in a moral dilemma, since he really doesn’t know what to do. He suffered a big salary cut, his bonuses are no more, his daughter is about to emigrate to find a job; and he’s supposed to arrest the man that targets the very people that did everything they possibly could to lead the country into catastrophe? Should he do that? And, moreover, does he want to do it? The third part of the trilogy came out towards the end of last year, it is called Psomi, Pedia, Eleftheria (Bread, Education, Freedom) and in it the author turns his gaze on the so-called Genia tou Politexneiou (The Generation of the Polytechnic University) which helped to bring down the dictatorship in Greece in 1973. The young people behind the revolt were to rise to power in the years to come and betray all their beliefs and break all their promises in order to cling to their posts in government and the glory that came with them. As one can gather Markaris is not only a crime fiction writer but also a social commentator. He keeps his eyes and mind open, he listens to what the people all around him have to say, he watches what’s going on in his front yard and really talks his mind. As one of Haritos´s friends says in Che Committed Suicide: “The revolution became a t-shirt;” and an empty one at that. The latter is one of four novels by the author available in English. The other three are The Late-Night News, Zone Defence and Deadline in Athens. With which book should a reader start the journey into Haritos´ world? Well, any of the above will do, since they all are stand-alone novels. I personally started with Che Committed Suicide and then went back to the older books in the list and didn’t regret it for a minute. Markaris is a consistent writer who keeps his standards high. If I was asked by someone to tell which famous detectives he reminds me of, I would say Michael Connelly’s Harry Bosch and Ian Rankin’s John Rebus. What’s the common denominator? Their unflinching quest for the truth. Because in the end it’s all about the truth, isn’t it? Will it set you free though? Haritos is not one to ask, or say. If you really want to find out what is going in Greece right now Markaris is your man. And if you love high quality crime fiction he can definitely deliver the goods. This article was first published at the American website Criminal Element more than a year ago.